The former lead of Google's Android Open Source Project opens up about what apps and devices he adores and how his personal home screen setup helps him stay productive. 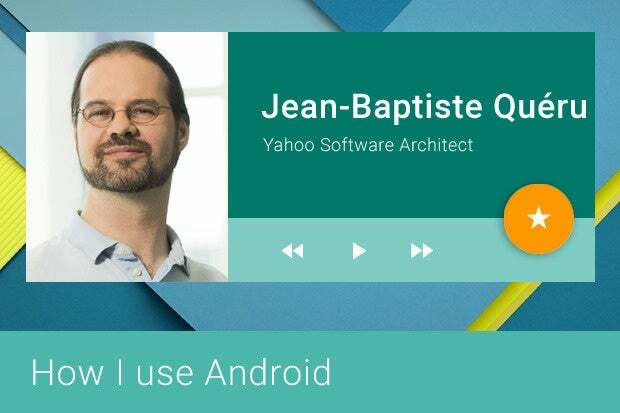 Few people are as known and loved among Android enthusiasts as Jean-Baptiste Quéru -- or JBQ, as he's more often called online. JBQ spent years as the maintainer and public face of Google's Android Open Source Project (AOSP), the publicly accessible source code that makes up Android and is used by manufacturers and developers to get the software onto devices. JBQ left Google a little over a year and a half ago and took up the post of software architect and senior principal engineer at Yahoo, where he works on the company's ever-expanding suite of Android apps. So how does a guy so deeply connected to Android use the platform himself? Time to find out. In his own words, this is how JBQ uses Android. Your current primary phone: One might say I have three primary phones. The Sony Z Ultra GPe (Google Play Edition), a large phablet, is great for multitasking and also where I test the latest beta versions of Yahoo Android apps. I also have an iPhone 5, to test the iOS versions of Yahoo’s beta apps. Finally, I have a first-generation Moto G, which I use primarily for phone calls and always have in my pocket -- but also use to experience Yahoo’s apps on a mainstream Android device. What case is on your phone (if any): While I don’t normally keep a case on my phones, I often have my Z Ultra in a leather case that doubles as a phone stand. Your current tablet (if any): I have both a first-generation Dell Venue 8 and a first-generation Kindle HDX 8.9. I also bought a Kindle HD6 to test on, as smaller tablets are becoming more and more popular. Although not quite a tablet, I bought an HP Slatebook 14, a laptop that runs Android, to experiment with. I’ve found it to be a great experience for apps that are able to take advantage of the large touchscreen and full-size keyboard. Your current smartwatch (if any): I have an LG G Watch that I got at last year's Google I/O. A quick walk-through of your home screen setup: I use Yahoo Aviate as my launcher, which takes care of surfacing information right when it's useful, and that simplifies my life. My main screen is incredibly simple. It only contains the handful of apps that I'm likely to use many times through the day in all kinds of contexts, and I actually also rely a lot on Aviate's other screens to guide me through my apps. These screens are called Collections and Spaces. With Collections, Aviate intelligently organizes my apps for me, and at most I’ve had to do a tiny bit of fine-tuning so that the first five apps in each Collection are the ones I'm using the most. Finally, my Spaces: Aviate automagically shows me what's most relevant for me depending on the time or place. As an example, on my Today Space, Aviate gives me my calendar, the weather for my location (and tapping it opens Yahoo Weather for that location), and I've added a few extra news apps. I love how Aviate switches to the Music Space as soon as I plug in my headphones, and all of my music apps are already there for me. It even gives me information about the artists I listen to. There's also a Space when I'm traveling or for when I’m at work, and each has just what I need in that context. 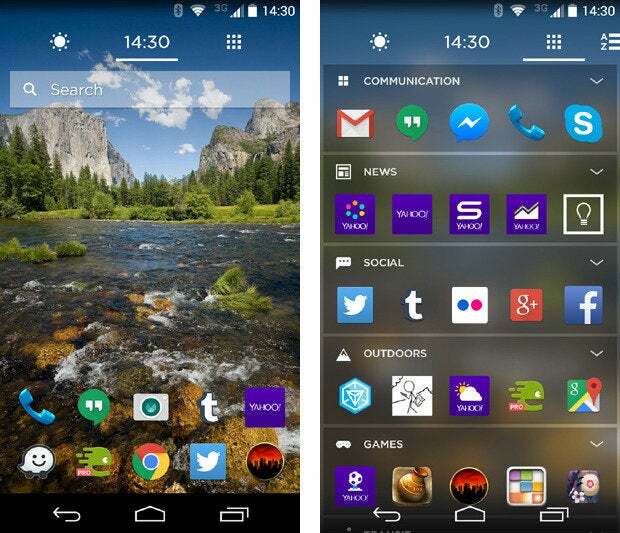 What launcher you're using: Yahoo Aviate. At some point a few weeks ago I accidentally disabled it and ended up in the classic Android launcher, and I felt horribly lost. What wallpaper you're using: I use a photo I shot in Yosemite, literally standing on a rock surrounded with water. I was lucky to get a cloud to cross the sky right as I got to my spot. Anything else of note (interesting customizations, any special icons, etc): No -- no customizations or special icons. Really, I just use straight Aviate. Yahoo News Digest, which I read every day at 8 a.m. and 6 p.m. on the dot, to keep up with the most important news. I also use the Yahoo app for personalized news and Yahoo magazines. Hangouts, as that's how my wife and I stay in touch. Waze when I travel by car, Transloc when I take public transit (my local transit agency uses it for real-time information), Google Maps when I'm on foot. 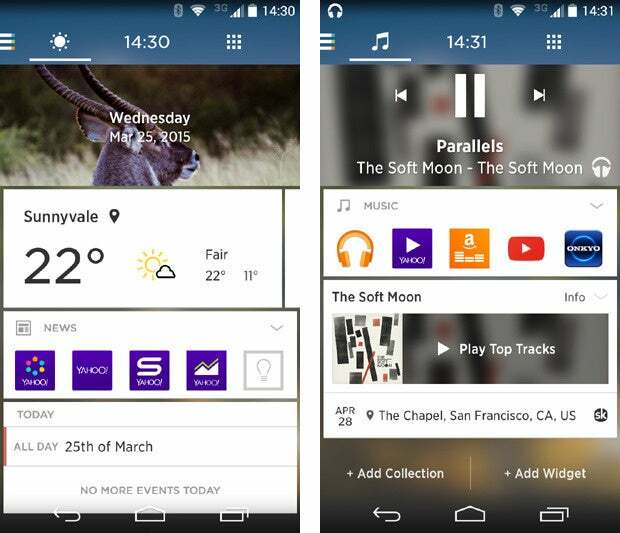 Google Play Music both at work and at home. Various email apps. Gmail, Inbox, and Yahoo Mail each have their unique strengths. Check out more Android expert profiles below or in the official Google+ collection -- and stay tuned for even more entries in the weeks to come!